Because of strong winter frosts (-20°C), the vines require protection. The optimum solution is the traditional method where the vines are covered with the soil from the inter rows. Today this operation is mechanised and lends well to the traditional training and pruning system of the vertical cordon (Figure 5). Over recent years, alternative methods have been trialled; two or three years after establishment, the primary shoot is bent to form a horizontal cordon but keeping the arm flexible as before winter the cordon will be bent closer to the soil to allow it to be covered it with soil from the inter rows (Figures 5, 6, 7). 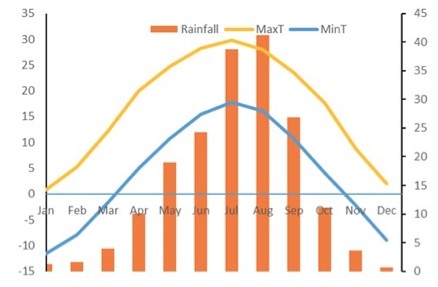 The training system is therefore a vertical shoot positioning which allows better light penetration and aeration at the canopy and bunch levels (Figure 7). New vineyards are currently planted (Figures 8, 9) mainly with red cultivars as Cabernet Sauvignon. The row spacing is 0.80 m and the distance between the vines within the row is 3 m, allowing the mechanical covering of the vine with the soil. The most significant diseases are Botrytis, Powdery and Downy Mildew. The Mildew requires four to six sprays a year depending on the climate. Very few wood diseases have been observed thus far. 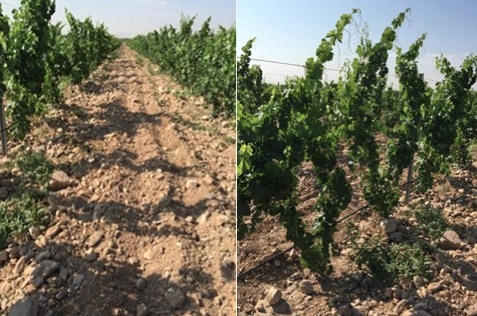 There is no Phylloxera but the grapevines are grafted for other considerations: studies conducted in the Ningxia region demonstrated that grafted vines are more tolerant to water stress and winter low temperature (Wang, 2006). Nonetheless further experimentations on rootstocks should be considered. The rootstocks currently used are mainly 3309, SO4, 5BB, 1103P. The vines are predominantly watered through drip irrigation. The water is sourced from the Yellow River or from subsurface sources. Looking at the wine style it is interesting to notice that most wines from Cabernet-Sauvignon are fruity with notes of prune and blackberry, soft tannins, a good acidity, very little note of green pepper as it is a warm climate during ripening. The Ningxia wines do present some complexity when blended with Merlot and/or with other varieties as Petit Verdot. The wine from Cabernet-Gernischet are more on mature fruit notes (prune). For most red wines, the wood (French barrels) is well integrated. 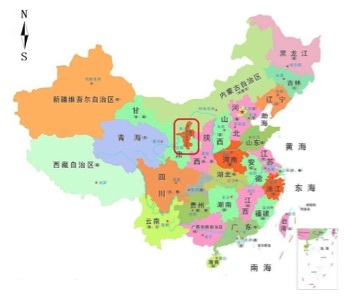 The Ningxia wine industry comprise around 80 wineries called “Chateaux”. The prices of the wine range from 15 to 50€. Figure 9 shows some examples of brands and labels and Figure 10 presents a view of a winery and a tasting room for the public. Perspectives. 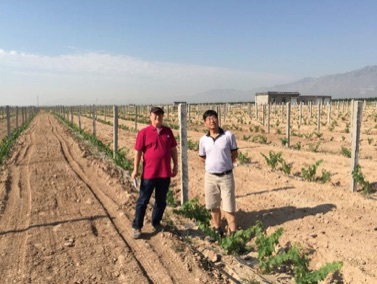 While quality of Chinese wines has improved over the past 10 years, further benefits can be gained within the vineyard by experimenting with other varieties and rootstocks; improving irrigation management; trialling sequential harvest to find the harvest sweet spots or increase wine style diversity; improving canopy manipulation. The authors are very grateful to Dr Suzy Rogiers (DPI-NSW, NWGIC, Australia) for the proofreading of this article. Figure 1. The Ningxia province in China. One of the largest cities is Yinchuan. Figure 4. 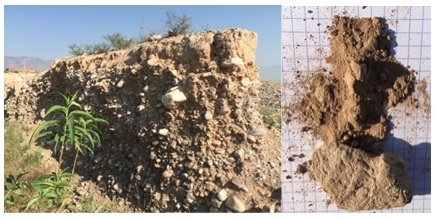 Example of fine sandy soil with stones, this type of soil is considered to be of high quality for the grapevine. The sand is famous and used to make concrete. Figure 5. 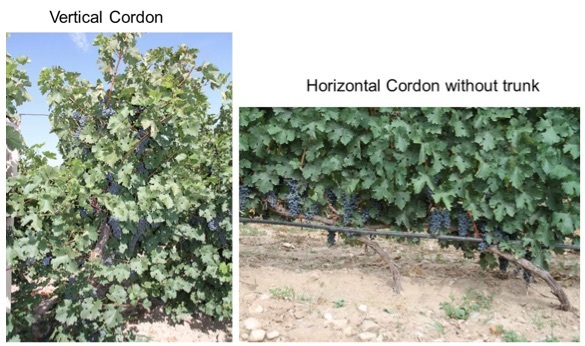 Example of the training and pruning system called the vertical cordon used in the Ningxia region (Chardonnay). The vertical cordon allows the arm to be bent before winter so that it can be covered with the soil from the inter rows. This cultural practice is mechanised nowadays and has been implemented over the past few years. Figure 6. 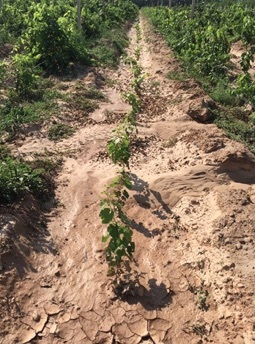 Example of a two years old vineyard planted with Marselan on this quality sandy and stony soil. Two or three years after planting the main shoot is bent to form a horizontal cordon without a trunk. The training system will therefore be a vertical shoot positioning (V.S.P.). The cordon will be bent somewhat further before winter to be closer to the soil and will be mechanically covered with soil from the inter rows to be protected from winter frost as temperature can reach -20°C. Figure 7. Detail of the arm that has been bent two or three years after planting to form a VSP pruned in cordon as shown by the photo on the right and side. Drip irrigation applies. Figure 8. From left to right, Professors Alain Deloire (Montpellier SupAgro, France) and Zhenping Wang (Ningxia university, China). Figure 9. 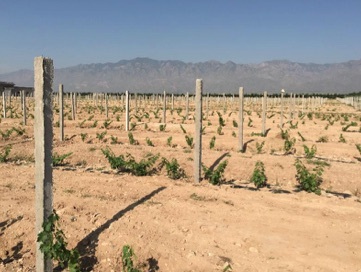 New vineyard planting in the Ningxia wine province, near to Yinchuan city. The distance between vines is 0.8 to 1 m and the distance between rows is a minimum 3 m to allow mechanisation, mainly the covering of the bent vines before winter to protect them against frost, using the soil from the inter rows. At the background, the Helan mountains form the borders of Inner Mongolia and Ningxia province. Figure 9. 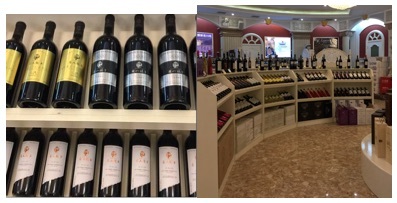 Examples of wine labels produced in the Ningxia province and view of a wine shop in Yinchuan. Figure 10. Views of a tasting room for the public and of a winery.